Grapes matured in anis are a traditional Christmas/New Year thing. Our neighbours usually given us some every Christmas in a glass with the accompanying liquid. They invariably do it early in the morning so it basically blows our heads off for the rest of the day. Off we went to buy the bottle of anis for the grapes we had been given from nextdoors. Most makes of anis are sweet but there are a couple of dry ones. Anis de Mono is our poison of choice. I washed the grapes, and filled the jar. A whole bottle of anis went into the grape jar!!!!!!!! They plumped up in no time, swelling out with the anis. After a couple of days, I had to try one. Yummy. Of course. I decided to spoon a little liquid into my teacup which I was eating them in (run out of bowls – all in the dishwasher). Wait!!!! Where is that potent incredibly strong grapey anisy liquid? Not there. Just some watery nothing in particular. All the anis had magically transferred itself to the grapes. How could it do that? More to the point, how come when my neighbour dished up grapes and liquid – it tasted like pure alcohol? Got it. 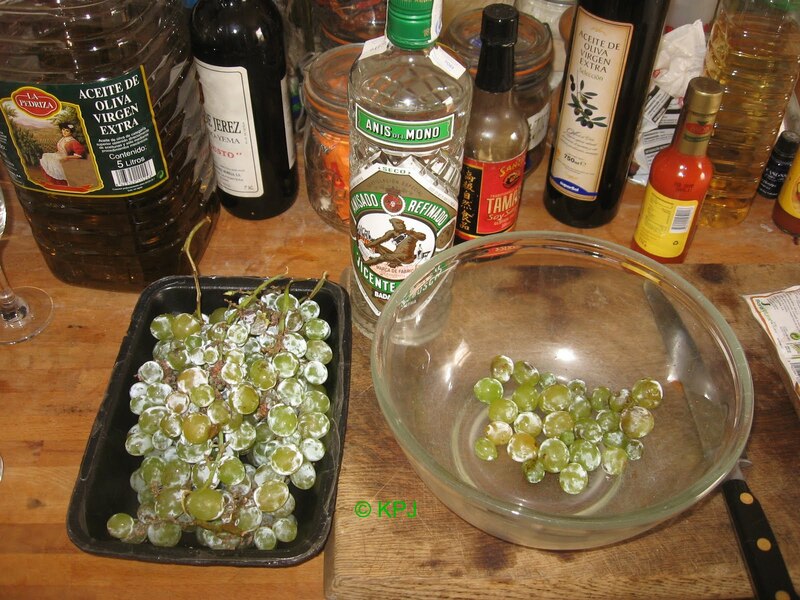 My crafty – and generous – neighbour wasn’t really giving us the left over dregs from the fermenting grapes. She had topped up our glasses from a brand new bottle. No wonder we always felt rat-arsed. greetings – i completely agree with you about the sweetness of most anis – and i love and miss Anis de Mono. can’t get it here in the states. however, i cheat! :) one part DeKuyper Anisette to one part (or a bit less) good vodka. i use Svedka. top off the ‘a bit less’ amount with some water, add a teaspoon of anis or fennel seeds (i like a couple peppercorns as well) and you know… it’s damn tasty! chin-chin! Greetings to you James. I used to loathe anis drinks, whether anisette, ouzo, Pernod, whatever. I also disliked fennel which I now love, suspect the taste comes with age. Mixing vodka and anis sounds very potent. I have a bottle of Smirnoff Blue vodka in the cupboard (export strength – 50%), it tends to get used for mouth ulcers or twingey teeth rather than drinking. I think the idea of adding the seeds and peppercorns is good. 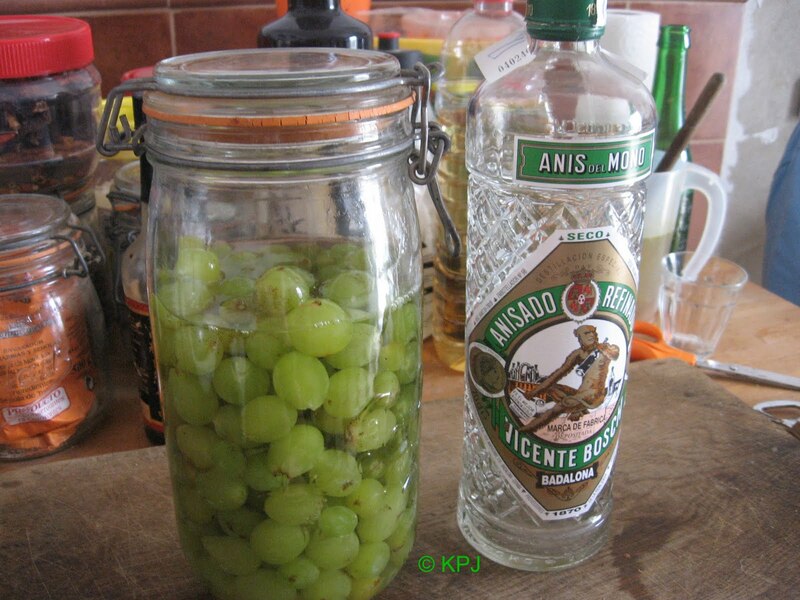 I’ve not had any grapes from the neighbours this year, so no excuse to a bottle of anis. o… not so potent. anis is 60 proof and vodka is 80 proof. one could always add some water. i just like how it cuts down on the sweetness. topped off a gallon of grapes with my anis mixture today! christmas is right around the corner – haha.